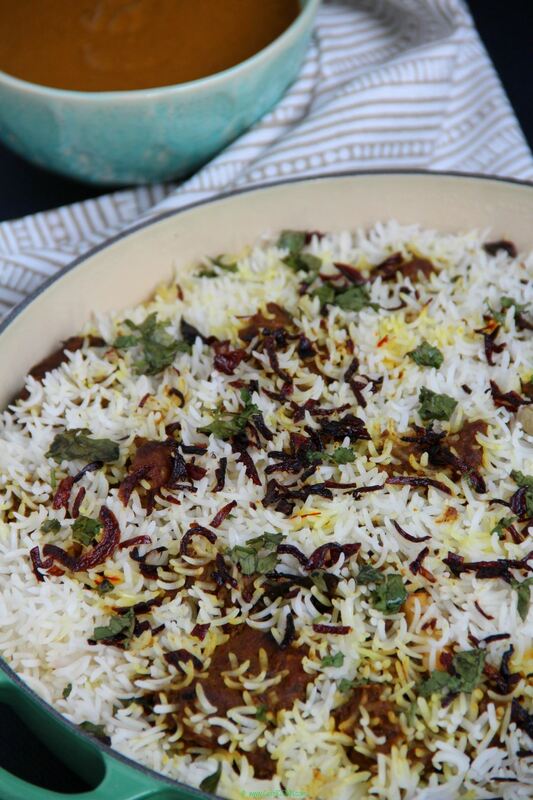 Keeping up my promise to share Parsi recipes this month here is my recipe for Pulao Dal. 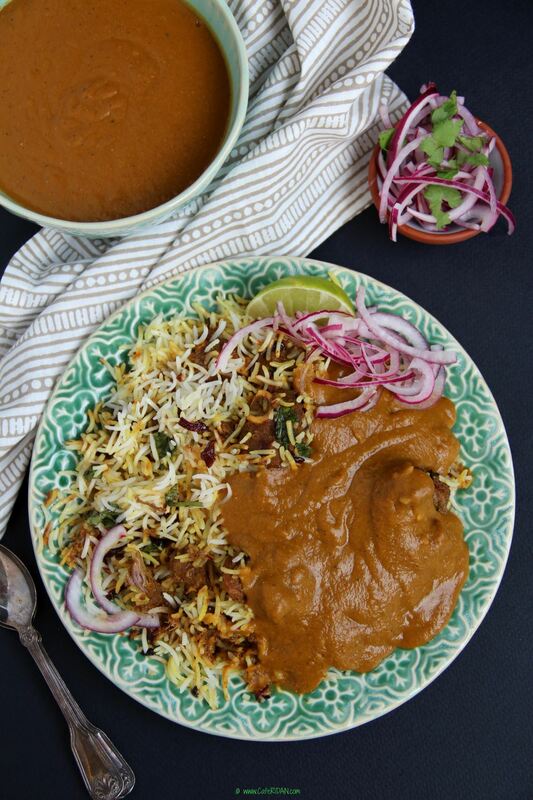 It is a mutton pulao eaten with dal that is cooked with veggies and spices. Pulao can be eaten as-is but on auspicious occasions is always served with the dal. This pulao recipe is from my sister-in-law Cheri who is a fabulous cook and the dal recipe is my Granny’s. This recipe takes slightly long to make but it is definitely worth the effort! The meat is marinated overnight with yogurt and spices. This allows the meat to get tender and it melts in your mouth after it is cooked. I always make pulao with goat meat but you can also use lamb. Goat meat is best cooked slow or it will get tough and chewy. Make sure not to add too much water to the meat. You want it dry once it is cooked. Rice is flavored with whole spices and then layered with the meat. 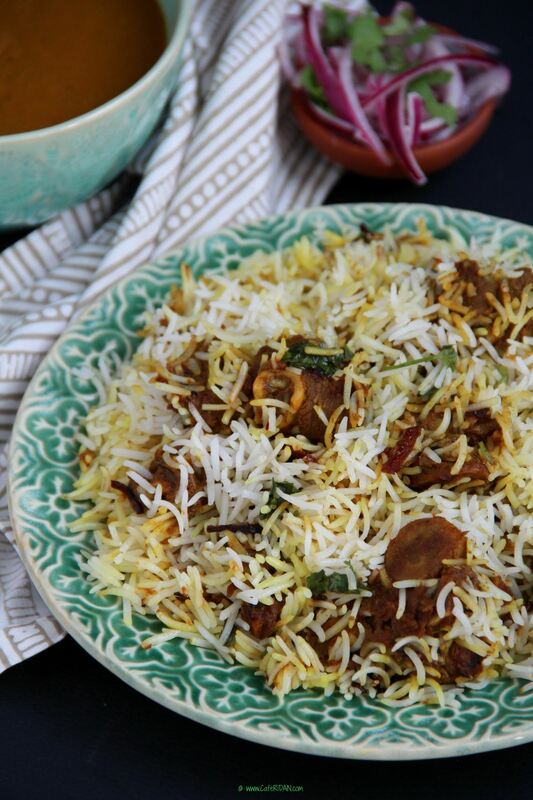 The sprinkling of saffron on each layer of rice adds a pretty golden color and flavor. The ghee helps to keep the rice moist as it cooks in the oven. This dal is pretty similar to the dhansak dal but does not have meat. Dhansak masala, which is a blend of roasted powdered spices is added to this dal. In a large bowl marinate meat with yogurt, 1 teaspoon turmeric powder, 1 teaspoon chili powder, 2 teaspoons salt, ginger and garlic paste. Marinate overnight or for at least 6 hours in the refrigerator. Heat oil in a pan and add green cardamom pods, cloves, black cardamom, bay leaf, mace and cumin seeds. Let them splatter for a couple seconds. Then add the sliced onions and green chili. Cook on low medium heat stirring often for 10 minutes until the onions are golden brown. Add the marinated mutton and stir well. Cook on medium high for about 5-7 minutes until the mutton is brown. Lower the heat to low, add a cup water, mix well and cook covered for one hour thirty minutes. Stir a few times in between. In case the mutton is still a bit tough add some more water and cook until the mutton is tender and the water has completely evaporated. Wash the rice and soak in water for about 30 minutes. Drain the water and add 8 cups of water along with the salt and whole spices. Cook uncovered on medium heat until the rice is almost done but still a bit al dante. Drain in a colander and set aside. Warm milk and soak saffron strands in it. Brush a deep oven proof dish with a little ghee. Layer a third of the rice at the bottom of the dish. Sprinkle a little saffron milk, ghee, cilantro and fried onions over the rice. Then gently layer half the mutton over the rice. Add another layer of rice with saffron milk, ghee, cilantro and fried onions, then the rest of the mutton and then the final layer of rice with saffron milk, ghee, cilantro and fried onions. Cover with a tight fitting lid and bake for 15 minutes. Wash all the dals together in a bowl. In a pressure cooker (will need 4 whistles) or an instant pot (on bean preset function) cook the dal with water, a teaspoon ginger garlic paste, salt, carrot, potato, pumpkin, onion, cilantro and mint leaves. Heat ghee in a small frying pan. Add the garam masala and onions. Sauté for about 7-8 minutes until onions are brown. Add ginger garlic paste and fry for a minute. Then add pureed tomatoes along with the dhansak and parsi sambhar masala. Cook for 15 minutes until the oil separates. Add this mixture to the cooked dal. Allow it to cook and then puree the dal to a soup like consistency with a hand blender or in the food processor. Bring the dal back to a boil and cook on low heat for about 30 minutes. Stir often. Serve the pulao and dal together.